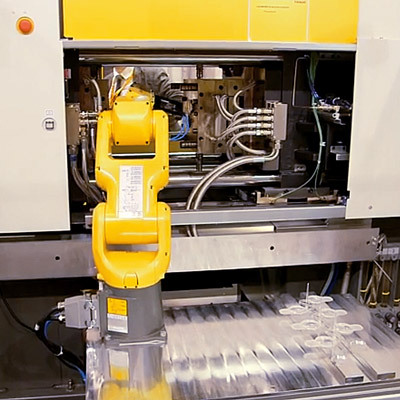 FANUC offers a wide range of versatile automation solutions to help you make your plastics business more efficient. Whatever the process – be it injection moulding, machining, machine tending, parts handling or palletising – FANUC can provide you with everything from a standalone machine, such as the Roboshot injection moulding machine or plastics machining centre, to a dedicated production cell complete with robots and advanced Power Motion control. No matter what you choose, not matter how big or small your solution, the centrepiece of every FANUC installation is the world’s most reliable CNC. Providing a common platform for everything that FANUC makes, when combined with advanced FANUC machining and robotics solutions it is the key to increasing your productivity, improving your efficiency and driving down your cycle times. Optimise your value chain right from the very start of the production process using FANUC front-of-line automation. 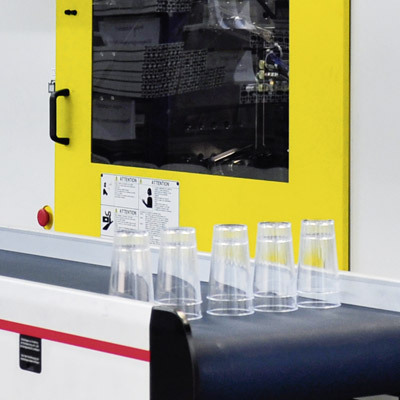 Whether it's tool making, depalletising, line charging or even the planning and setup of complete production lines, any number of tasks can easily be automated to help you improve your plastics manufacturing processes and lower your costs. ROBOSHOT is a market leader in precision injection moulding. Its efficient temperature control and cooling technology combine with rapid part removal by means of linear robots and power motion to deliver winning results. Set up completely automated production lines, which integrate handling, packing and palletising to one highly efficient process. Thomas Hähn from Hahn Automation: "Because we built the entire MasterShot as a package from a single source, the delivery of the components, right down to the completion of the system, didn't take longer than eight weeks"
A die that would have previously taken 40 hours to produce can be programmed and set in 2 hours. Within 16 hours it was ready to run on an extrusion line. Discover how Wilks improved tooling with wire cut EDM. CNC controls are useful in a wide range of industries, from aviation through automotive to medical. And in all fields where various metals and plastics are processed. Processing plastics clearly represents the most delicate stage in the value chain. Whether it is injection moulding, turning, extruding or polishing surfaces, FANUC’s tailor-made solutions support you to automate many operations. As simple as they are cost-effective, FANUC solutions deliver state of the art technology for injection moulding, CNC control and tooling. Fully electric CNC controlled high-speed injection moulding machines can produce large numbers of plastic parts in a very short time. 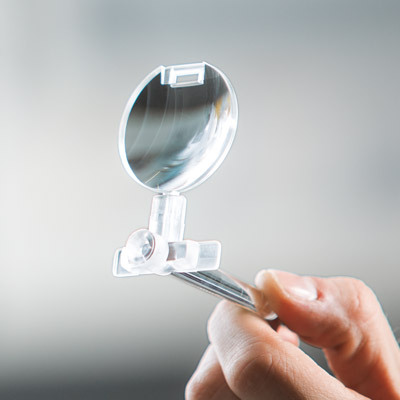 Benefit from the highest level of accuracy at a low cost per piece. Tool making for PVC profiles is a cost effective process. By automating, tooling times can be reduced by 50%. Surface precision down to the nanometre is achieved using state-of-the art ROBOSHOT injection moulding machines. Given the properties of synthetic materials, light-weight lathes are ideally suited to machining plastics. The fact that less force is required also allows the use of smaller, more efficient drive motors. Efficient production of small to medium sized seals with complex dimensions or profiles is achievable using a CNC controlled lathe. "We have been working successfully with FANUC for several years now, and we are convinced of the high reliability and product quality of the CNC controls" -Johann Glocknitzer. Follow the link to the full story. The plastics industry is always striving to achieve greater efficiency and higher productivity. Automating pick, place or sorting tasks, not only enables the manufacturer to optimise the production processes but also to react flexibly to new developments, thus staying ahead of the competition. Smart visual recognition technology and sensor systems for line tracking and picking tasks offer a highly reliable improvment of handling tasks in plastics manufacturing. Tending of injection moulding, turning or cutting machines can be efficiently automated with robots. Heavy payloads can be easily handled at high frequency using industrial robots. The gripper simultaneously exhibits features such as grip force accuracy, vision and a sense of touch. Fast picking of plastic parts after or before extrusion or injection, for example, can significantly improve cycle times. Large packs of insulation material can be palletised by a robot using a vacuum gripper to protect the material from damage. 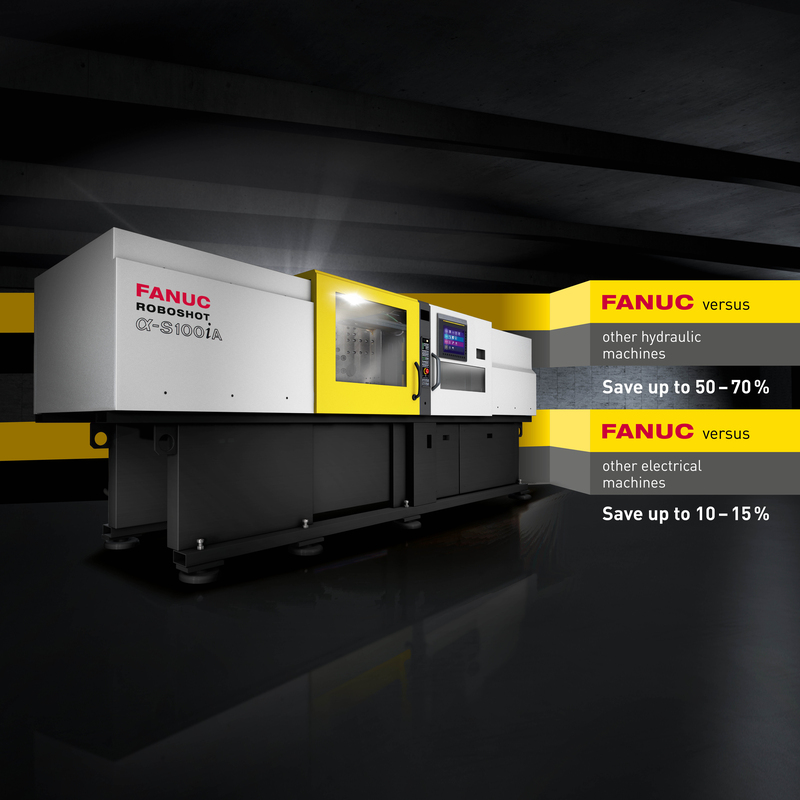 FANUC electrical injection moulding machines save up to 15% energy compared to standard electrical, and 50-70% compared to hydraulic machines. Stacks of material are taken from a conveyor and placed on pallets by a dedicated FANUC palletising robot.